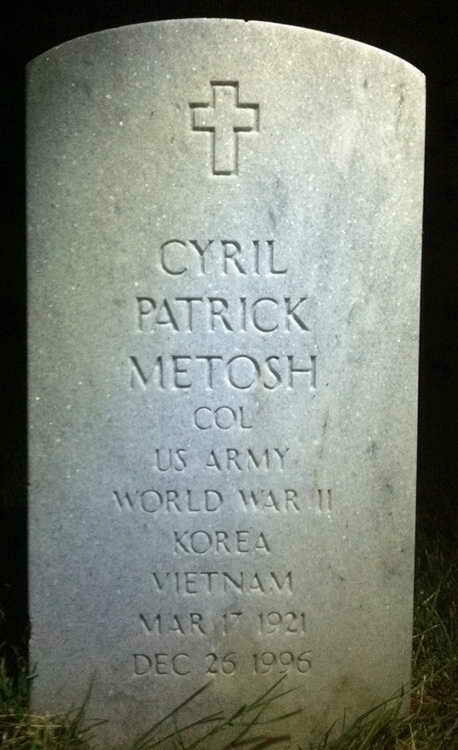 Grave markers for Cyril P. and Margaret H. Metosh in Section 60, Site 1476, Arlington National Cemetery (Arlington county), Arlington, Virginia. 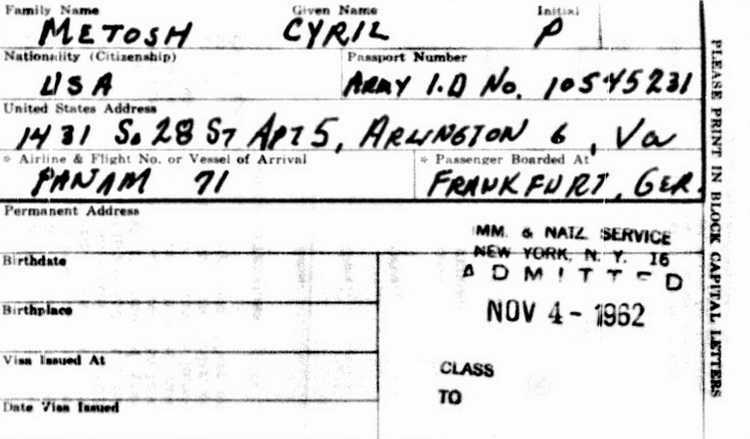 Cyril registered for the draft on 15 February 1951 and entered service on 17 April 1944. On 1 October 1945 Pvt Metosh was transferred from the 505th PIR to Hq Hq, 508th PIR. He was promoted to the temporary grade of T/5 on 6 December 1945. 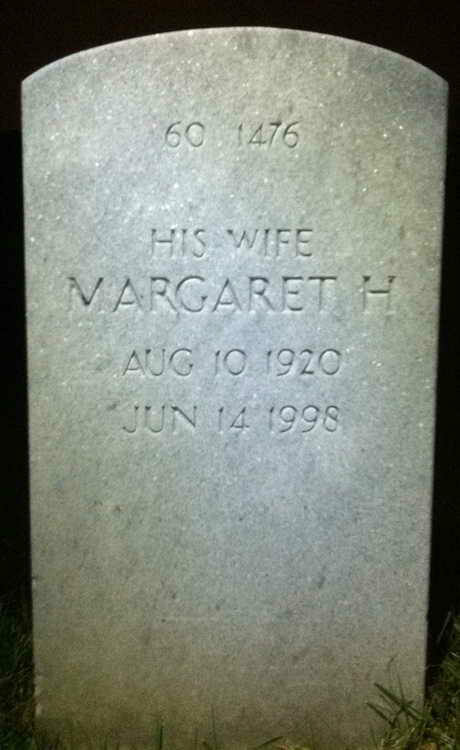 After he returned to the U.S., he married Margaret [nee: Roy) Hattan [1920-1998] in Pasquotank county, North Carolina. 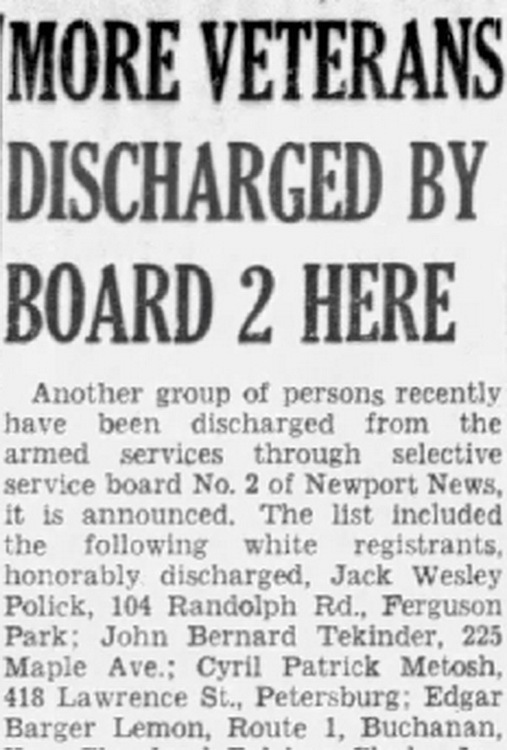 According to this news article in the Daily Press, Newport News, VA, 13 Jan 1947, Cyril was amongst men listed as being "discharged from armed services through selective service board 2 of Newport News." 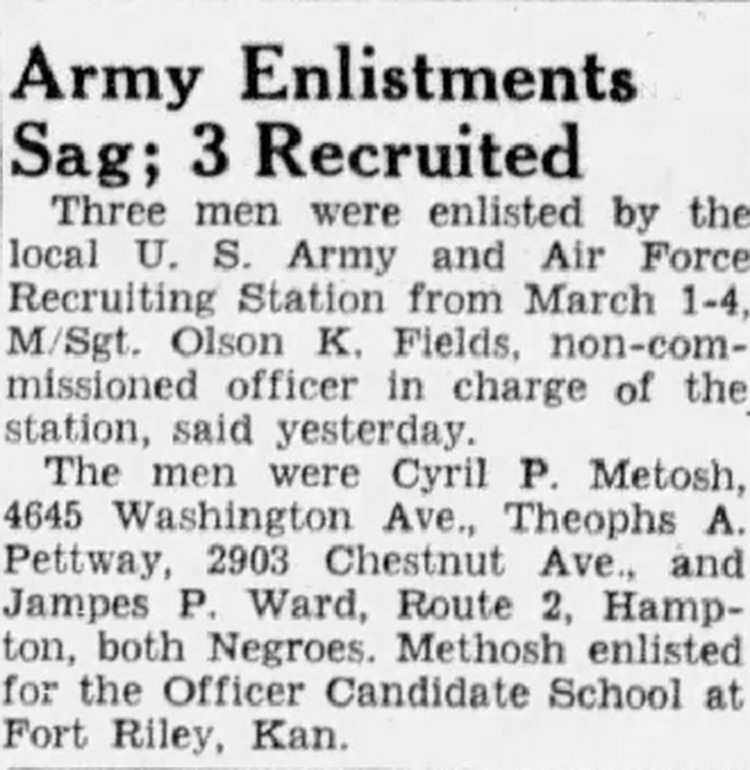 A second news article from the same newspaper on 3 March 1949, Cyril reported that Cyril had re-enlisted for the Officers Candidate School at Fort Riley, Kansas. The Officers' Registers later carried him as being discharged on 1 September 1949 to accept a commission as a 2nd Lt on 2 September 1948. 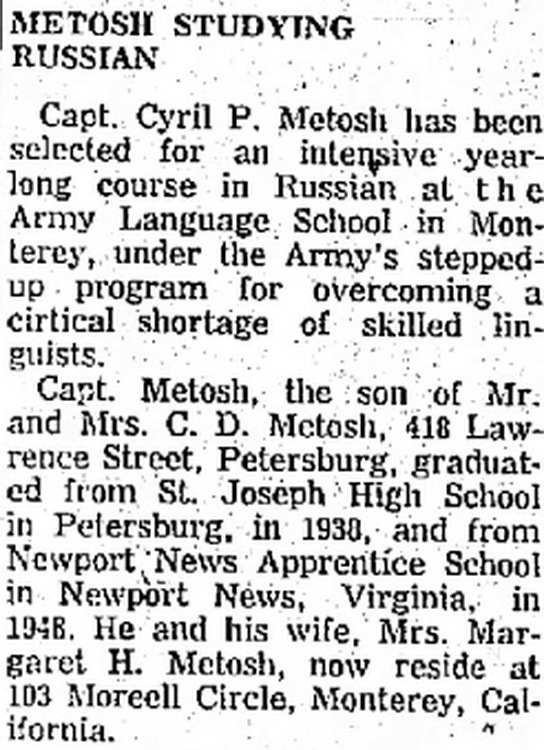 He was promoted to Captain on 29 October 1954 and on 7 July 1957, the Progress-Index, Petersburg, VA revealed that Capt Metosh was heading for the Army Language School at Monterey, CA. Over the years he had a number of promotions ... Major (17 March 1962), Lt Col (11 April 1964), and Colonel (19 June 1971). While serving in Vietnam Col Metosh received a Joint Service Commendation Medal (Achievement) on 13 March 1972 and a Legion of Merit (1st Oak Leaf Cluster) on 7 July 1972). 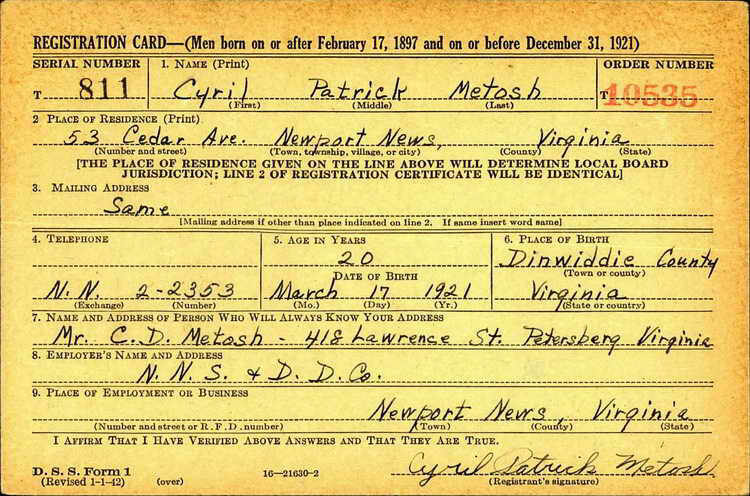 When and where he received the first Legion of Merit is unknown.